If the essential function of marketing is to create or increase demand, then the essential function of demarketing is to reduce or redirect (if not eliminate) that demand. If nothing else, living is a series of necessary adjustments. It is only one of several thousand observations about human experience that Philip Kotler’s inquisitive and creative mind has formulated during a career that began more than 50 years ago. Kotler then explains, “Marketing is an area of applied economics, which looks into how prices of goods are actually determined as goods move through different stages from producers to wholesalers to retailers. Economists had little to do say on how demand is influenced by advertising, sales-promotion activities, product features, advertising, marketing channels. They also had little to say on how demand is influenced by advertising, sales-promotion activities, product features, merchandising, and other marketing tools. Traditional economists said that those tools simply shift the demand curve upward without adding much analysis or measurement.” He knew there was much more to it than that. Over the years, I have read and reviewed many of Kotler’s 60+ books but I really don’t know how to describe this one. It is part memoir, part diary, part scrapbook, part photo album, part family history, part biography, part autobiography, part journal, and part manual. The contents suggest the scope and depth of his kaleidoscopic worldview and venturesome mindset. 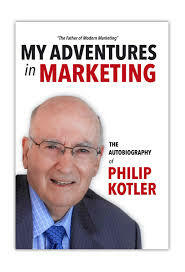 Kotler seems to have an incurable habit of connecting dots between unlikely objects or subjects. Early on, he recognized that marketing and economics were separate but interdependent as are success and failure, joy and sorrow, arrogance and humility, and hope and despair. His mind reminds me of a Swiss Army knife…but also a scalpel and chainsaw. Working my way through his various adventures in marketing (actually, adventures in [begin italics] living [end italics]), I felt as if I were chasing a lovable kangaroo on steroids. It’s hard to keep up with him but I struggled to do so because I was so eager to find out what he had in mind next. Thank you Phil Kotler for letting me and other readers gallop along with you. I agree that you are “The father of marketing” but I think you are also “The master of revels.” The pleasure of your company is indeed a great pleasure as well as a privilege.